It is a time of peace. For one thousand years, the esteemed Order of Jedi Knights has protected the Galactic Republic by wielding a mysterious power called the Force. Now a new threat is rising, as an alliance of star systems known as the FEDERATION has surrounded the defenseless planet of Naboo with a blockade of deadly battleships. Hoping to prevent war, the Supreme Chancellor of the Republic has dispatched Jedi Master Qui-Gon Jinn and his apprentice Obi-Wan Kenobi to settle the conflict. 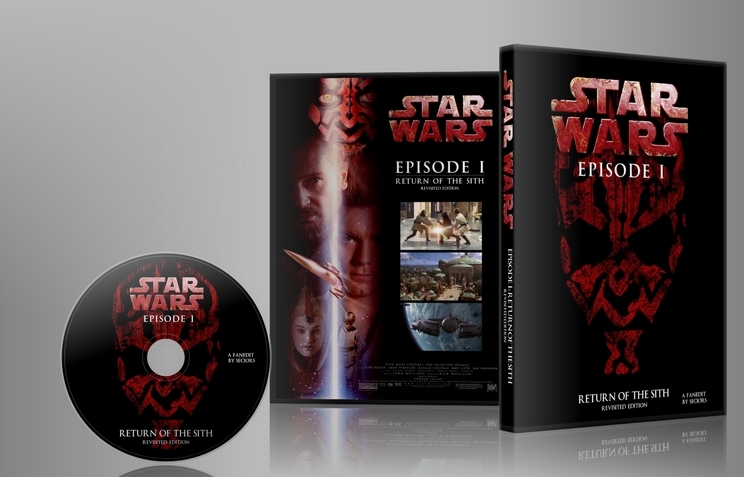 “Return of the Sith: Revisited Edition” is meticulously designed to re-envision Episode I as a proper beginning to the epic six-part story of Anakin Skywalker. It is a time when the Jedi and Galactic Republic are at the peak of their power. It is the moment when the Sith and the Dark Side of the Force re-emerge after being dormant for one thousand years. And most importantly, it is when we meet young Anakin Skywalker, a boy strong with the Force, whose clouded future portends great danger. • Uebelator for the awesome cover art! •	Fanedit.org and the entire fan editing community! •	Provide a streamlined and engaging story that introduces us to the Star Wars Universe, where the magic and mysticism from the Original Trilogy (OT) take precedence over complicated plotting, politics, and CGI characters. •	Change the Trade Federation to just “The Federation.” This change is meant to reduce the politics involved with the PT. The Federation now is a rogue group that eventually evolves into the “separatist” movement in my Episode II. •	Make the identity of the Emperor a true secret until Episode III. Thus, Lord Sidious does not appear in this edit, making the appearance of the Sith as much a mystery to the audience as they are to the Jedi. •	Present Anakin as a strong with the Force, with great compassion and feeling for others… but also is clearly perceived as dangerous to train as a Jedi. •	Highlight the beginnings of the future romantic relationship between Anakin and Padme. •	Adhere to the spirit and style of the OT as closely as possible, remembering that the audience includes both those who are young as well as those who are young at heart. •	Help link the PT with the OT by introducing characters that span across them: R2D2 & C3P0; Jabba the Hut; Greedo; Obi-Wan; and of course, Yoda. •	Remove as much bad humor, bad acting, boring politics, and Jar-Jar as possible, yet still retain a strong sense of story that leads directly into my Episode II. •	Lord Sidious does not appear in the movie. This is so that the “reveal” that Palpatine is Lord Sidious does not take place until Episode III. It also greatly simplifies the plot. The Federation (e.g., the Viceroy) has apparently acted on their own accord in trying to take over Naboo. This also makes Darth Maul’s appearance more mysterious and menacing. •	Jar-Jar is cut to the absolute minimum; even the underwater city visit is completely gone. His lines and antics are extremely cut down throughout the movie. Basically, if it could be cut without affecting the plot or damaging the visual/audio, it has been cut. •	Removal of all mentions midichlorians, “chosen one,” virgin birth. •	No ‘yipee’s or ‘oops’s from Anakin. •	Politics in general have been greatly reduced. •	The Pod race greatly shortened, and only follows Anakin around the track. •	Completely revised final battle sequencing, to make the true climactic moment be the Jedi Battle with Maul, and the death of Qui-Gon. •	RE: Now in 1080p HD! •	RE: The audience is allowed to view Palpatine as a bit more manipulative now, though in this narrative we merely see his motives as a pure power grab to become chancellor. There still is no hint or way to link him as a Sith Lord. •	RE: Further focus on the notion that fear of loss will be Anakin’s downfall. •	RE: Remove the use of “Darth” for anyone except Darth Vader. •	Neimodian dialog trimmed down to make them more threatening and less dumb/scared. And again, there is no Lord Sidious! •	RE: When the assassination attempt occurs on the Jedi, Qui-Gon’s line about what the name of the poison gas is has been cut. •	Trimmed throne room scene to get to the point that this is an invasion. No line by the Queen about not taking any action that will lead to war, since it’s not really up to her anyway….the invasion has already started. And later on, she actually does take action to fight a war. •	Trip to the underwater Gungan City is completely cut. There is only one plot-point for this scene, and it is to have a reason why Jar-Jar sticks around for the rest of the movie. I have tried to accomplish this using Jar-Jar’s declaration of being Qui-Gon’s servant, as well as keeping a trimmed down version of the Padme-cleaning-R2 scene where she point blank asks him what are you doing here? •	RE: Reinstated a short line by Jar-Jar and him following the Jedi off-screen after the Jedi say “let’s get out of here before more droids show up” to allow for a better visual transition, and also to help the audience see that Jar-Jar is coming along for the ride, whether the Jedi like it or not. •	RE: Jar-Jar no longer jumps down (and “comically” gets his foot caught) from the ledge when the Jedi rescue the Queen. •	RE: Removed some of R2’s “smile for the camera” moment, or whatever it was that made him take so long to repair the ship. •	No scene where R2 gets commended by the “queen” and then orders the real queen to clean him up. (nice.) This also gets rid of the redundant dialog of declaring they are going to tatooine. •	Darth Maul lands on tatooine directly after the Jedi do, which is also at night. •	“No more commands from Her Highness today” cut. I don’t recall any commands, so I find the line nonsensical. I also want to allow the implication that Qui-Gon knows Padme is the Queen. •	No Jar-Jar antics in Watto’s shop. •	RE: Removed Padme’s line about Anakin being a strange little boy. In the RE, I’ve tried to strengthen the relationship between Padme and Anakin in order to help set the stage for their Episode II romance. •	Reinstated the Anakin Fights Greedo deleted scene, but placed it after Qui-Gon talks to Obi-Wan over the transmitter regarding what assets they have left. The scene replaces the whole Jar-Jar trying to eat the chicken sequence. •	Removed “He’s a protocol droid to help Mom.” Help Mom do what, exactly? Deleted. •	Trimmed dinner scene at Anakin’s home. Beyond removing Jar-Jar antics, I’ve made the discussion about Anakin entering the pod race just between him and his mother, without interjections from padme and Qui-Gon. •	RE: Changed Anakin’s reasoning with his mother about entering the Pod race to be that the prize money would be more than enough to pay for the repairs (instead of being about that he “loves” pod racing). Trying to make a more mature Anakin, as well as showing his compassion and selfless nature at this point in his life. •	RE: Removed Padme’s whining about the putting all our trust in a boy we hardly know (to support Padme/Anakin relationship) and that the Queen will not approve/I don’t approve (too pouty). •	Removed mention about Anakin having crashed Watto’s racing pod. 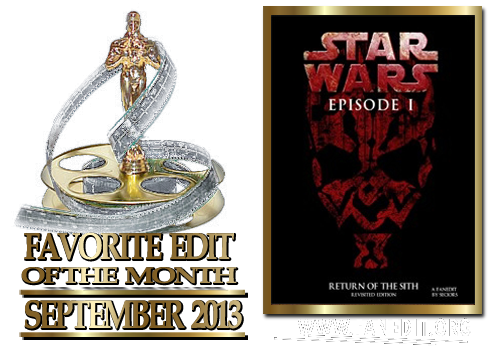 •	Removed the group of kids, and Jar-Jar antics from the starting-up-the-pod scene. •	Removed the midichlorian level check of Anakin. •	Removed discussion that Anakin has never won a race. •	Pod Race announcers are not shown onscreen. Some commentary can still be heard, where appropriate, to maintain a loose “we-are-watching-a-sports-TV-event” feeling, as well as assist the audience in understanding what is actually happening. •	RE: Re-instated Sebulba sabotaging Anakin’s pod, but their pre-race meeting is still cut. This is to support the plot event of Anakin’s pod breaking down late in the race; now there is a reason instead of being just a chance occurance. •	RE: Removed Anakin’s mother’s visit to Ani before the race. Now only Qui-Gon visits Anakin. •	RE: Removed Padme’s line about the Jedi “assuming to much.” Again, it sounds pouty, and also I think it is not necessary. Finally, there’s already a small implication that Qui-Gon knows she is actually the Queen; ending on what he says to her makes this much stronger. •	The Pod race is significantly shortened. No introductions, and no Anakin “spinning out of control” sequence. The action only follows Anakin and not the other racers. •	RE: Pod race event is cut down even more, but is also more informative about progress during the race. •	No final shot of Sebulba sliding to a stop; his final fate is left unknown. •	RE: Ani’s mother no longer says Anakin has given hope to those who have none. Seems a bit preachy and unnecessary. •	Removed Qui-Gon saying “Will you be all right?” to Anakin’s mother. Like, what is she going to say to that? •	RE: Further cut the goodbye-to-3P0 scene to remove any explicit mention that Anakin built 3P0. So, 3P0 doesn’t call him his maker. •	When saying goodbye to his mother, Anakin doesn’t say “I can’t do it, Mom. I just can’t do it.” He also doesn’t say he will come back to free his Mom. The scene is much stronger without these lines. •	Reinstated the Goodbye to Jira / Probe Droid scene, which leads directly to them running to the ship. So the Probe Droid talking to Darth Maul scene is cut. •	Removed “Qui-Gon, sir, wait! I’m tired!” So he runs all that way and within 50 feet of the ship he decides to ask to take a break? Cut. •	Cut Qui-Gon’s line “Tell them to take off!” – Anakin doesn’t do it, and Obi-Wan tells them to take off as if he thought of it himself, so why keep it? •	Trimmed scene where Anakin gives Padme the necklace; removed some of Jar-Jar’s muttering, as well as some of the political talk of the senate. Also removed “japor snippet” as if the audience would actually understand that. Finally, removed Ani’s “I care for you too, only I…” and Padme’s response. Now the scene ends on Padme telling Anakin her caring for him will remain. •	RE: Trimmed and reworked the above scene even more to completely remove all traces of Jar-Jar, and to further push the Anakin/Padme semi-romantic vibe this scene touches upon. This scene is now also partially rescored. •	RE: Removed Ric Olie’s line pointing out the Chancellor’s shuttle. •	RE: Removed Jar-Jar’s antics on the landing platform, including his mistimed bow, and his playing with the security guards in the background. •	Palpatine’s line about “there is a question of procedure” – too political (e.g., boring info) – RE: Reinstated this line for better visual continuity. Otherwise the existing jump cut back to the Jedi with the Chancellor would look even worse. •	RE: Removed Anakin looking back to Qui-Gon for no apparent reason, and Padme calling to Ani to come along, like he’s a pet or something. •	RE: Completely re-ordered the Coruscant scene sequence, to improve the story flow. Now we go from landing platform → Jedi Council → Palpatine/Queen → Senate. Original had the Jedi Council scene in between the other two scenes. •	RE: Right before the Queen/Palpatine meeting, removed initial shot of Jar-Jar and Anakin standing at the door (for no apparent reason, as they later leave in the background [also cut], again for no apparent reason). •	Trimmed Queen/Palpatine scene to tone down the politics, and also tone down Palpatine’s obvious push for the Queen to oust the Chancellor. •	Removed scene where Anakin looks for Padme to say goodbye before “his training.” The scene serves no purpose and slows things down. •	Cut Qui-Gon saying to Obi “You still have much to learn” seeing as moments later he says Obi is “ready “for the trials (RE: though I ended up cutting this line anyway), and even later tells him he is much wiser then Qui-gon. •	Cut mention that Anakin is too old (as the reason why he won’t be trained). Luke wasn’t, so Anakin isn’t either. Plus, Anakin looks like he would fit in with the Episode II Yoda classroom quite well, age-wise. (And that is a scene I do keep in my Episode II). •	RE: Cut the mention of “the trials” – we never actually get an explanation as to what these trials are, EVER. Now Qui-Gon just says Obi-Wan is “ready” and Yoda immediately jumps in saying the council will decide when he is ready. •	Trimmed scene where we find out Palpatine has been nominated; the Queen does not ask who else has been nominated but goes right to telling Palpatine she has decided to return to Naboo. •	Removed the hint of a smile by Palpatine during the transition to the Jedi Temple. •	RE: Cut the lines by Mace about conjecture that the “mysterious warrior” will be following the Queen to Naboo, and this being the key to unraveling the mystery of the Sith. Instead, I re-instated the lines about the Queen’s return to Naboo might escalate things with the Federation, which becomes the reason why they still need to go with the Queen. Again, the threat here as perceived by the Jedi is the Federation and possible war, as stated back in the new crawl. They have not made any progress regarding the “mysterious warrior” mentioning it at this point is not supporting the narrative. •	RE: Cut any trace of Jar-Jar when they leave Coruscant to head back to Naboo. •	Removed line about the Federation will arrest the Queen and force her to sign the treaty. •	RE: Tightened the above scene in other ways, to remove some of the strange pauses. •	Removed line about the Jedi not being able to use their power to help. What does that mean? Of course they use their powers all the time. I guess they can’t if it interferes with George’s scripting. LOL. •	Jar Jar doesn’t come out of the lake. So we never really know where the Gungan city is. So essentially, no one ever knows that the Gungans have an underwater city in my edit. •	Removed Boss Nass bringing up that the Naboo think they are better than the Gungans. Also, removed all of Boss Nass’s slobbering and weird sounds. •	The planning scene is trimmed; Boss Nass doesn’t make Jar-Jar a General. •	RE: Removed the “double diversion” in the dialog during the planning scene. Only the Gungans serve as a diversion now. •	When the battle begins, we see the Federation approach before the Gungans stop and put up their shield. •	RE: Cut the “Starting up the shields” line. •	We don’t see the droids activated from the space ship, they just become activated. RE: Reinstated this. Wanted to make it clearer that that the Droids are being controlled from the ship. •	No “ouch time” line. •	All Jar-Jar silliness is excised from the battle. •	“My guess is the Viceroy’s in the throne room” – already said during planning. •	Anakin decides to activate his ship, shoot the destroyers, and take off into space. There’s also no autopilot. •	RE: Reinstated Anakin’s line “We’ve got to do something, R2!” – not the best line, but it works better than complete silence from Anakin, I think. •	The battle sequence is rearranged to not jump around the four locations as much. •	RE: The battle sequence has been further refined with more re-ordering and trimming. •	Once everyone is captured, the sequence is simplified so that we first see the Queen capture the Viceroy, then we see Anakin enter/destroy the droid command ship, and finally we see the rest of the Jedi battle with Maul, starting with the first time they are trapped in the force field. •	RE: Qui-Gon’s battle with Maul is tighter, with no more shots of Obi-Wan watching. •	RE: Obi-Wan’s battle with Maul is tighter and more focused. Specifically, it starts off showing Obi-Wan acting on pure anger based on the loss of Qui-Gon. Cuts to the fight are made so that he never gains an upper-hand over Maul. But once Maul sends him over the edge, Obi-Wan regains his composure, and uses his wits and the Force to finally defeat Maul. I believe this is the moment that demonstrates Obi-Wan being truly “ready” to be called a “Jedi Knight” and THIS is his “trial” so-to-speak (just as Luke’s “trial” to fully become a Jedi Knight is to face and defeat Vader/the Emperor). 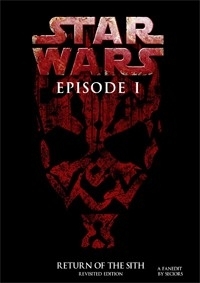 •	Obi-Wan’s killing of Maul is faster, so it doesn’t appear like Maul just waits to be killed. •	Qui-Gon doesn’t speak to Obi at the end…he is already dead. •	After all the battles, we don’t have the discussion with the Viceroy about explaining things to the Senate, and kissing their trade franchise goodbye. •	During the funeral, Yoda doesn’t say “no more, no less” about the number of Sith. RE: Reinstated this line, so that the music would not have to be changed, and this change was really not necessary for narrative purposes. •	No pan to Palpatine at the end of the funeral. RE: Instead, we cut back to Qui-Gon burning on the pyre to serve as the transition into the ending celebration. •	The ending celebration is greatly trimmed down; we don’t see Jar-Jar doing any of the silly activities, nor do we see the Gungans waving to the crowd, either from the animals or walking up the steps. Boss Nass doesn’t yell out audibly, nor does Jar-Jar. •	RE: New credits added for fan editor, deleted scenes restoration, crawl text contributors, workprint reviewers, and special thanks. •	RE: In Memoriam added at end of credits. Goodbye Toonces, and Susie. RIP. A. The pod race was quite exciting, not sure what edits were made here, but it seemed better than I remembered from the theatrical release. B. Young Anakin cringe was kept to a minimum and Jar Jar never got the chance to upset me while still having a quirky personality. C. Cut small problems that then get solved moments later as they aren't suspenseful during repeat viewings thereby making them pointless. From a technical stand point this was an impressive fanedit, visual quality was astounding and there were no dodgy frames/cuts, no audio blips or glaring sudden musical cues. The deleted scenes that were incorporated back into the movie added to the experience and development of characters. A. The film has been cut down to a mere 78 minutes excluding credits - there are no brakes here, the movie shares the necessary information then moves on. The end result is a nice action piece where you don't really care about the characters/events too much. It feels more like a recap than immersion into a living breathing world. B. The final battle and Sith duel seemed cut down a fair bit - slightly disappointing as its one of the more interesting parts of the movie. C. Cut nearly every character exchange not essential to the plot - this severely affects the character development of Qui-gon and Obi-wan, most of the other characters get developed effectively. Ultimately, Phantom Menace is a hard movie to save, but the editor cut a little too much here, leaving bare bones dialogue which made the film feel like an empty shell. A great version if you're marathoning the films and needed to get this one out of the way fast. Way better than the original by far and the best edit I have seen of Episode 1 until now. I particularly enjoyed the fast pace of the first 15 minutes and the edit of the end battle. I do find that the music sometimes cut abruptly (but I understand how hard it is to make the music fit sometimes), but the only negative point I have is that even though most of the Gungans/Nemoidians scenes were cut (a must in any respectable Episode 1 edit) the original voice acting was left intact. Some other editors have just replaced the voices of Jar Jar and company with alien languages and added subtitles: removing the horrible voices and thus allowing the editor to make the aliens more threatening and badass. But all in all, great work! I can't wait to show that to my brother during our Star Wars Marathon before we watch Episode VII in theater. Way, way better than the original. It was actually enjoyable! Thanks and keep up the good work! Recently I recommended the originalo Star Wars trilogy to a friend who had never seen them, and I sat down to watch the prequels again to see if they warranted a recommendation as well. I was surprised that they were even worse than I remembered them. Years ago I saw an SD version of TPM by "The Phantom Editor". I thought that it was an intriguing concept, but the low res quality of it put me off and I never really dug any deeper. Last month I dug out that copy of "The Phantom Edit", but was again disappointed. I decided to look for an HD copy, and that's when I stumbled onto FanEdit.org. Seciors was the first fan edit that I watched here, and he hooked me immediately. The relentless pace of his editing is incredible... this edit makes TPM not only watchable, but actually enjoyable. Almost every transition is flawlessly executed, and I agree with pretty much every trim he made. Jar Jar no longer annoys me in this cut, and I never once felt myself rolling my eyes. Since watching Seciors Episode I, I think that I've watched three of the other highly rated edits as well. As much as I like them, I keep coming back to Seciors as my favourite. There are really too many good things to say about this cut to list out. What sets him apart in my opinion are his bold editing choices. He's the only one that I've seen that chose to remove Darth Sidious altogether, which really paid off in my opinion. I love not only his editing out the "Chosen One" subplot, but also his clever editing of that entire discussion with Shmi. His restructuring of the final battles come to a much more satisfying conclusion. This edit actually feels like a Star Wars movie. I only have two suggestions that would make this edit flawless, and both deal with transitions in the last act. The audio transition after Queen Amidala says "everything depends on it" needs tweaking, but that's probably because you couldn't separate her dialogue from the musical queue. I'm not sure what can be done about this, but if you could somehow clean it up the transition would be flawless. The other suggestion is the end of the "Master and Apprentice" segment. If you could just find a way to extend the beat on Qui-Gon's funeral pyre, the transition would feel more natural. As it was, the transition felt a little abrupt. Again, not sure how this could be achieved with the footage available. I don't want to sound negative. Seciors edits of Episode I and II have restored my faith in the prequels. If I thought his Episode I edits were bold, wait until you get to Episode II. Who else would have thought to put the end of the movie at the beginning? I can't begin to tell you how brilliant and inspired decision that was. What I really want to know is, are you working on an edit of Episode III? I hope so, because I'd love to see what you do with it, and I'd love a proper ending to my favourite series of fan edits! My only request is not to add the footage from "The Other Boleyn Girl" that some chose to use. The colour pallets of the two movies couldn't be more different, and although the idea is a good one, the execution is too jarring. This is one of my favorite fanedits of Episode I, and the main reason is the pacing. This thing just barrels along, with smart choices to the action to make it more lively and exciting. Of all the edits of Ep. I I've seen, this one feels the most like a "Star Wars" movie. My favorite little edit is the way the Anakin/Greedo deleted scene is cleverly and seamlessly incorporated. A fantastic use of that sequence. My only complaint would be that the speed sometimes feels a little too break neck. Tatooine especially suffers from this, as I feel like a little more time taken here would help us get to know the characters. But if the material wasn't there, I'd rather it went by quickly like this anyway. There were a couple of slightly odd Audio cuts and transitions. Nothing was particularly wrong with the cut, but it would sometimes very clearly start or end a piece of music at a point that wasn't the natural conclusion. No biggie, especially since Star Wars movies are so difficult to edit sound wise. Overall a fantastic edit that's well worth your time!